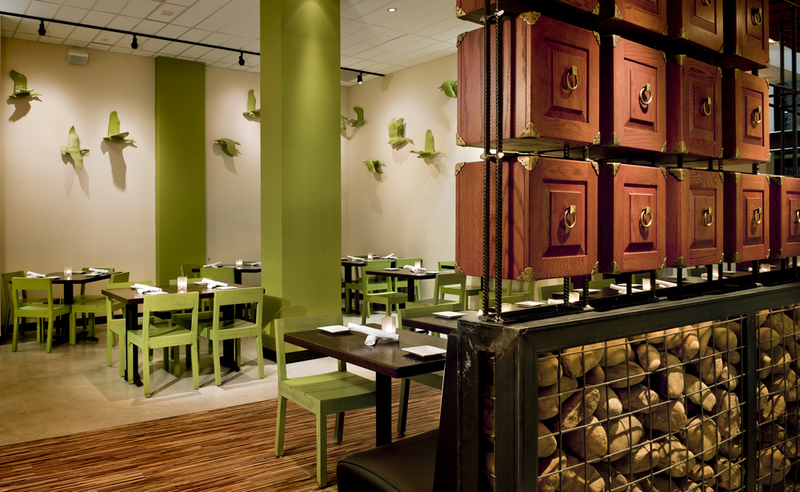 The design for Mandu came together as a playful reminder of the owners' past and a serious reminder of menu's history. GrizForm Design Architects modeled memory boxes separating the bar and dining room after wooden containers in an ancient Korean temple which were used to house precious artifacts. Carved wooden ducks in various stages of flight canvas the wall and are inspired by a story told by the owners about their fond memories growing up near a duck pond. Chairs painted a light shade of grass are arranged on floors made from wood scraps reminiscent of bamboo. Even when it's playing to a full house, Mandu fosters the illusion of tranquillity.